With the holiday season here, everyone wants to look their best for vacations, events, and photos. If you have limited time but want to naturally enhance your skin for the holidays, consider adding minimally invasive cosmetic treatments to boost beauty and health. In combination with thoughtful skincare, non-surgical cosmetic procedures, like microdermabrasion or dermaplane, can actually improve skin over time, leading to a healthier and more radiant appearance without any need for injections or surgery. By including skin treatments alongside daily skincare, you can achieve a natural boost that is both cosmetically enhanced in the short-term, yet also more rejuvenating and healthy in the long-term. Both microdermabrasion and dermaplaning are exfoliating treatments that remove the superficial layer of skin on the face, allowing for easier absorption of skincare products and even better makeup application. Both processes provide the benefits of a smoother texture and tone in the short-term, though over continual sessions, they are able to produce a multitude of other skin improvements, too. Microdermabrasion involves using a tool to sand down the skin’s epidermis, or top layer. Over time, this treats light acne scars, fine lines and wrinkles, reduces the size of pores, promotes blood flow, as well as improves facial blemishes and hyperpigmentation. According to a study conducted by Yale, microdermabrasion might also improve collagen production, leading to long-term skin elasticity and graceful aging. These treatments are gentle, yet effective, and maximize your skin’s potential in very little time. 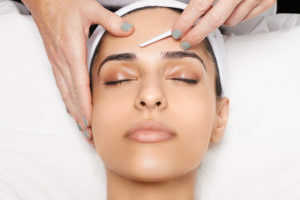 In contrast, the process of dermaplaning involves a blade that safely and painlessly removes the top layer of dead skin as well as fine facial hairs. This process, through multiple sessions, can vastly improve fine wrinkles, acne scarring, and fine facial hair, and in the short-term, instantly refreshes the appearance, providing a more even skin tone and texture. Both microdermabrasion and dermaplaning act as enhancements to skincare. In order to maximize the benefits of these treatments, you can use skincare products in between sessions that are recommended by our Licensed Medical Aesthetician, Rani Isbell. With instantaneous improvements to skin tone and texture, as well as the benefits provided by long-term treatments, microdermabrasion and dermaplaning are incredible tools that are perfect both for special occasions and overall health. If you are interested in improving your skin in time for the holidays without injections or surgery, call our office at (614) 890-5565 today to schedule an appointment. With treatments as advanced as ours, our friendly staff at Cosmetic and Plastic Surgery of Columbus is excited to help you on your skincare journey, providing short-term enhancements, and more importantly, long-term care.